The moment has arrived, the first catalogue featuring Natty is published online and will hit doormats all over the UK next week. For us, this is hugely significant. For the first time in history, companies are saying yes to featuring children with Down's Syndrome in their marketing material. Jojo Maman Bebe too are using a little boy called Seb as well as Natty. Of course it is only the thin end of the wedge, we want to see children using wheelchairs in instore poster campaigns, children with other disabilities in TV adverts. We don't want any company afraid to feature our children for fear of loss of sales. We have a very long way to go, but I am proud that we are here at the start, that we are making a difference. Thank you to all the families who have sent messages of support and encouragement, as well as beautiful photos of your own children. I helps to know you are all behind us. 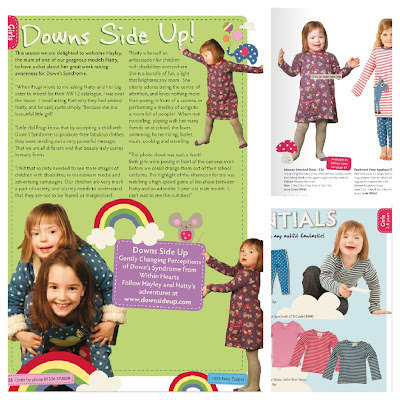 I hope many new parents see these happy images of two sisters simply enjoying dressing up in nice clothes and having fun together, and their fears of Down's Syndrome will be dispelled. I pray other children with disabilities will come forward to model, their confidence boosted by seeing images of positive role models in the media. Fantastic photos, one proud mummy, hey? and so you should be. Marketing professionals have the possibility of influencing how society thinks; this campaign is proof of that. Let us hope that in this Paralympic Age, other companies do the same.